I’m not endorsing any of these companies, but merely providing a list of experienced home elevation contractors. This list is not all-inclusive, but merely a suggestion of a few companies that came recommended based on their experience in this field. If anyone has specific experience they want to add good or bad, please let me know. Due to extremely high call volumes, most contactors are asking that you reach them by email. Wolfe House & Building Movers www.wolfehousebuildingmovers.com Phone: Tel: 610.488.1020, They require an architect’s plans or structural engineers drawings before giving an estimate. Ducky Johnson House Movers www.duckyjohnsonhousemovers.com You can schedule an estimate on the main page. I reached out to Myroncuk House Lifters and received an email back that they had decided not to lift any houses in Highlands. Anyone else have the same result? I heard back as well, same message, they have done work in N Monmouth co in the past but have decided against doing work in Highlands right now, made a note of it on the list so people don’t contact moving forward. I have received your “job packet” and I must decline to become any further engaged with your company. We are victims of Hurricane Sandy, located in the now “V” (ABFE) Zone. We now have five complete three ring binders full of paperwork and photos pertaining to FEMA, our insurance company, our mortgage company, federal, state and local government rules and regulations as well as a complete binder dedicated to our contractor and much more. We are at least two months away from returning to our home. If you think we are going to dedicate more time to your ridiculous specifications for obtaining an estimate for raising our house, you must be high. If you would like to come to Highlands NJ and do some actual work in assessing the cost of raise our home, we welcome you. Otherwise, thank you anyway. Call us for a free house lifting estimate – Stone Creek Builders. Maybe you should ask them why???? There is another company for home elevation who has provided great pricing and has been bet informative. They are shore house lifters. They use the lates in unified hydraulic lifting machines, have been very responsive, and had great references. They have lifted several homes in the area. You should check them out. 848-480-2500. What’s it cost to raise a home in the US? Pete Sommer (732) 291-5250 is the best house lifter in New Jersey. He has done nothing else for his whole life. We live on the hill in Atlantic Highlands. We needed to put a basement under our former bungalow, now converted into a house. Our house was so close to the edge of the hill that many lifters would not touch the job. Some builders wanted three times the price charged by Pete Sommer. Our friend the licensed engineer recommended Pete as the best house lifter in the area. We were not disappointed. He even managed to save an adjacent tree that his brother thought would have to go. Fifteen years later, everything is still perfect with the foundation. W. A. Building Movers & Contractors Inc. is established as a full service General Contractor. In the past years, we have built residential and commercial structures, including renovations of schools, institutional structures, etc. Our knowledge gained through building has paved the way to save structures from demolition, while providing alternative ways to repair failed foundations in unstable soils. We have the capabilities to install piles of wood, steel and concrete to establish a lasting base for the existing structure to rest upon. This corporation has just been formed in nj .although I Gary Thomas was raised here graduated Notre Dame high school in Lawrenceville 1985. I then moved down south to north carolina were I perfected my lifting skills across the south . This corporation offers a 99% damage free lift since our kinks were worked out years ago! Our corporation has been approved by the DCA is now pending our huge insurance policy wich includes workers comp riggers and cargo , builders risk, and we also have a production bond on our jobs all designated by the state of new jersey . Attention: Gary Thomas, Please contact Gaetano “Tom” Bracco. Very Important. Thank you. It is a good idea to have House Lifting Long Island to secure a price with the concrete company before your home is raised. The lift and the new foundation are two separate costs. After we lift the home the new foundation is built underneath and then when ready we lower the house onto its new foundation. It is good policy to have a signed contract with a fixed price before any work is done to your house. It is unfortunate but prices have been known to be changed just prior to a lift. When using HLLI that will never happen. We will make everything as simple as possible to make you lifting experience a pleasant one. Awesome Content. 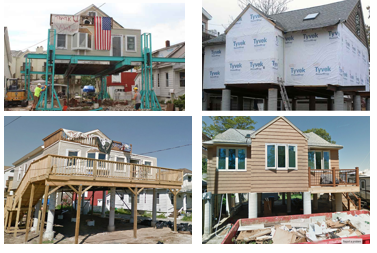 As a house lifting and raising contractor in new jersey. We are trying to give my best and our first priority is to give satisfaction to my potential customers.